In January 2008, I began working on a story for The Chronicle of Higher Education on the many connections of the new president of West Virginia University, Michael S. Garrison. Prior to being selected as WVU's new president in April 2007, Garrison served as a chief-of-staff to the former governor, and immediately after that, served as a lobbyist for public and private clients in the state. That story was eventually published (subscription required), and included a graphic I concocted outlining the connections (some questionable) brought about by Garrison having been a former lobbyist. In the process, I submitted two open record requests, one for Garrison's former lobbying records, and another for his meeting schedule as president of the university. One of the most interesting documents were two lobbying registrations that showed that Garrison was a lobbyist for Mylan, Inc., a corporation that makes generic drugs and is the employer of an executive, Heather Bresch. In December 2007, the Pittsburgh Post-Gazette accused WVU of granting Bresch an executive MBA despite lacking the needed credits. Two of Garrison's lobbying registration forms when he lobbied for Mylan were actually signed directly by Heather Bresch. An independent investigation by West Virginia University later determined that university officials had improperly awarded Heather Bresch an eMBA. Some time later, Garrison announced his plans to resign his post as president of the university in September 2008. 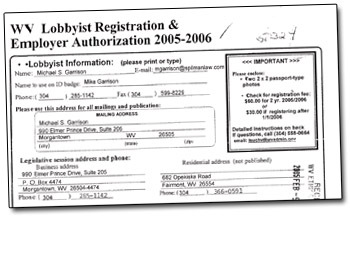 These two lobbyist registration forms for Mike Garrison were actually signed by Heather Bresch, who at the time was the vice president for government relations at Mylan, Inc.
All in all, Garrison had 27 registered clients at the peak of his lobbying in 2006. These documents relate to Garrison's expenses as a lobbyist (including, on page 27, the use of a WVU football skybox owned by Centra Bank for a function with the Legislature and the current governor). Garrison's meeting schedule for the first six months or so of his presidency at WVU, from July 1, 2007 to January 11, 2008. They were heavily redacted by administrators at WVU, but I include them for inclusion sake.